Sir Thomas Stamford Bingley Raffles (July 6, 1781 – July 5, 1826) was the founder of the city of Singapore (now the Republic of Singapore), and is one of the most famous Britons who expanded the British Empire. 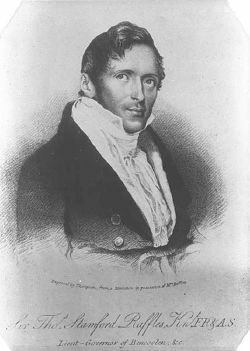 With such names as Cecil Rhodes, Lord Curzon, and Lord Cromer, Raffles is all but synonymous with the British imperial project. Like Cromer and Curzon, he also wrote about the people over whom he ruled as well as making a significant contribution to natural history and biology. He was a founder, and first President, of the London Zoological Society. His accumulated a large collection of natural history and Malayan folk-lore. He was also a Fellow of the Royal Society. While Rhodes takes credit for expanding the Empire in Africa, credit for expansion into the Far East goes to Raffles. However, Raffles had a genuine concern for the welfare of the people he governed (several million as governor of Java), and pioneered a form of partial self-government in Java. He stopped the slave trade. Indeed, the profit-oriented British East India Company in whose service he was officially employed were unhappy with his costly reforms. After his return to England in 1816, he was sent back to the East in a less senior capacity (as a lieutenant governor), although it was in that role that he negotiated the right to establish the Port of Singapore. Raffles was a product of Empire yet he did not fully share the attitudes of racial superiority and or the exploitative greed of his colleagues. Raffles was born on the ship Ann off the coast of Jamaica. Little is known of Raffles' parents. His father, Captain Benjamin Raffles, was involved in the slave trade in the Caribbean, and died suddenly when Raffles was 14, leaving his family in debt. The younger Raffles immediately started working as a clerk in London for the British East India Company, the quasi-government trading company that shaped many of Britain's overseas conquests. In 1805 he was sent to what is now Penang in the country of Malaysia, then called Prince of Wales Island, starting a long association with Southeast Asia, starting with a post under the Honorable Philip Dundas, the Governor of Penang. As he was gazetted assistant secretary to the new Governor of Penang in 1805, he married Olivia Mariamne Devenish, a widow who was formerly married to Jacob Cassivelaun Fancourt, an assistant surgeon in Madras who had died in 1800. It was also this time that he made acquaintance with Thomas Otho Travers, who would accompany him for the next 20 years. His knowledge of the Malay language as well as his wit and ability gained him favor with Lord Minto, governor of India, and he was sent, first to Malacca, then, in 1811, after the annexation of Kingdom of Holland by France, mounted a military expedition against the Dutch in Java. The war was swiftly conducted by Admiral Robert Stopford, General Wetherhall, and Colonel Gillespie, who led a well organized army against an army of mostly French conscripts with little proper leadership. The previous Dutch governor, Herman Willem Daendels, built a well-defended fortification at Meester Cornelis (now Jatinegara), and at the time, the governor, Jan Willem Janssens (who, coincidentally, surrendered to the British at the Cape Colony), mounted a brave but ultimately futile defence at the fortress. The English, led by Colonel Gillespie, stormed the fort and captured it within three hours. Janssens attempted to escape inland but was captured. The British invasion of Java took a total of 45 days, with Raffles appointed the Lieutenant-Governor by Lord Minto before hostilities formally ceased. He took his residence at Buitenzorg and despite having a small subset of Englishmen as his senior staff, he kept many of the Dutch civil servants in the governmental structure. He also negotiated peace and mounted some small military expeditions against local princes to subjugate them to British rule, as well a takeover of Bangka Island to set up a permanent British presence in the area in the case of the return of Java to Dutch rule after the end of the War of the Sixth Coalition in Europe. His ability to speak Malay allowed him to communicate well with the Temenggong and Tengku Hussein. During his governorship, Raffles introduced partial self-government, stopped the slave trade, became an early opponent of the Opium trade by placing strict limitations upon its importation, much to the dismay of Calcutta, led an expedition to rediscover and restore Borobudur and other ancient monuments, and replaced the Dutch forced agriculture system with a land tenure system of land management, probably influenced by the earlier writings of Dirk van Hogendorp. He also changed the Dutch colonies to the British system of driving on the left. Under the harsh conditions of the island, Olivia died on November 26, 1814, an event that devastated Raffles. In 1815, he left again for England after the island of Java was returned to control of the Netherlands following the Napoleonic Wars, under the terms of the Anglo-Dutch Treaty of 1814, but not before he was officially replaced by John Fendall on account of the failure of the colony financially during his administration, as deemed by the successors of Lord Minto in Calcutta. He sailed to England in early 1816 to clear his name, and en route, visited Napoleon, who was in exile at St. Helena, but found him unpleasant and unimpressive. In 1817, Raffles wrote and published a book entitled History of Java, describing the history of the island from ancient times. In 1817, he was knighted by the prince regent, to whose daughter, Princess Charlotte, Princess Royale he was particularly close. At the publication of the book, he also stopped using the name "Thomas," preferring to use his middle name, "Stamford," possibly to avoid confusion amongst his associates with Sir Thomas Sevestre or his cousin who bore the same name. On February 22, he married his second wife, Sophia Hull. He was appointed as the Governor-General of Bencoolen (now Bengkulu) on October 15, 1817, and set sail to take the post with his new wife. Raffles arrived in Bencoolen on March 19, 1818. Despite the prestige connected with the title, Bencoolen was a colonial backwater whose only real export was pepper and only the murder of a previous Resident, Thomas Parr, gained it any attention back home in Britain. Raffles found the place wretched, and set about for reforms immediately, mostly similar to what he had done in Java—abolishing slavery and limiting cockfighting and such games. To replace the slaves, he used a contingent of convicts, already sent to him from India. It is at this point when he realized the importance of a British presence that both challenged the Dutch hegemony in the area and could remain consistently profitable, unlike Bencoolen or Batavia. However, the strategic importance of poorly-maintained but well-positioned British possessions such as Penang or Bencoolen made it impossible for the British to abandon such unprofitable colonies in such close proximity to the Dutch in Java. The competition in the area, between Raffles and the aggressive Dutch de jure Governor, Elout, certainly led at least in part to the later Anglo-Dutch Treaty of 1824. Raffles looked into alternatives in the area—namely Bangka, which had been ceded to the Dutch after its conquest by the British during its occupation of Java. Bintan was also under consideration. Despite the fact that Warren Hastings overlooked the island before settling upon Penang in 1786, the Riau Archipelago was an attractive choice just to the south of the Malay Peninsula, for its proximity to Malacca. In his correspondences with Calcutta, Raffles also emphasized the need to establish a certain amount of influence with the native chiefs, which had greatly waned since the return of the Dutch. Raffles sent Thomas Travers as an ambassador to the Dutch, to possibly negotiate an expansion of British economic interests. When this failed, and when Raffles' own expeditions into his new dominion found only treacherous terrain and few exportable goods, his desire to establish a better British presence was cemented. However, the Anglo-Dutch Convention of 1814 was not completely clear, especially on the issue of certain possessions such as Padang. The Convention of 1814 only returned Dutch territory that was held before 1803, amongst which Padang was not one of them. Raffles asserted the British claim personally, leading a small expedition to the Sultanate of Minangkabau. Yet, as Raffles confirmed with the sultan regarding the absolute British influence of the area, he realized that the local rulers had only limited power over the well-cultivated and civilized country, and the treaty was largely symbolic and had little actual force. Meanwhile, Major William Farquhar, the British Resident of Malacca, had been attempting to negotiate commercial treaties with the local chiefs of the Riau Archipelago, especially with the heads of the Sultanate of Johore. Due to the death and subsequent turmoil of the sultanate at the time of Farquhar's arrival, Farquhar was compelled to sign the treaty not with the official head of the sultanate, but rather, the Raja Muda (Regent or Crown Prince) of Riau. Noting it as a success and reporting it as such back to Raffles, Raffles sailed to Calcutta in late 1818 to personally secure a British presence in the Riau area, especially Singapura, which was favored by both him through the readings of Malayan histories and by Farquhar's explorations. Despite Lord Hastings' less-than-stellar opinion of Raffles before (which had necessitated his trip to England to clear his name at the end of his tenure as Governor-General of Java), the now well-connected and successful Raffles was able to secure the permission to set up a settlement where in Malaysian history the name Lion City was applied and was in a strategically advantageous position. However, he was not to provoke the Dutch, and his actions were officially disavowed. Despite the best efforts in London by authorities such as the Viscount Castlereagh to quell Dutch fears and the continuing efforts to reach an agreement between the nations that eventually became the Anglo-Dutch Treaty of London of 1824, as well as to send instructions to Raffles to undertake far less intrusive actions, the distance between the Far East and Europe had meant that the orders had no chance of reaching Raffles in time for his venture to start. After a brief survey of the Karimun Islands, on January 29, 1819, he established a free-trade post at the southern tip of the Malay Peninsula. It was established that there was no Dutch presence on the island of Singapore. Johore also no longer had any control of the area, so contact was made with the local Temenggong, or Raja. The contacts were friendly and Raffles, knowledgeable about the muddled political situation, took advantage to provide a rudimentary treaty between the nominal chiefs of the area that called for the exclusivity of trade and the English protection of the area. Members of Raffles' party surveyed the island and proceeded to request the presence of the sultan, or whoever at the time had supreme nominal power, to sign a formal treaty, while Major Farquhar was ordered to do the same in Rhio. A few days later, the formal treaty signed by a man who claimed to be the "lawful sovereign of the whole of territories extending from Lingen and Johore to Mount Muar." This man was Tengku Long, who, although having had no previous contact with the British, had certainly heard of the might of the British navy and was in no position to argue against the terms. However, Raffles was able to charm the man and reassure him of that the Dutch posed no threat in the area. Farquhar's attempt to establish a more favorable treaty in Rhio was met with greater challenge, as the Dutch were present and made for a rather awkward position. The Dutch were justifiably alarmed and sent a small contingent to the island. Despite a covert offer of subterfuge against the Dutch offered by the Raja of Rhio, Farquhar returned and an official protest was sent by the Raja to Java regarding the matter. Raffles declared the foundation of what was to become modern Singapore on February 6, securing transfer of control of the island to the East India Company. Much pomp and ceremony was done, and the official treaty was read aloud in languages representing all nations present, as well as the Malay and Chinese inhabitants. Farquhar was officially named the Resident of Singapore as Raffles was named as "Agent to the Most Noble the Governor-General with the States of Rhio, Lingin and Johor." Although ownership of the post was to be exclusively British, explicit orders were given to Farquhar to maintain free passage of ships through the Strait of Singapore and a small military presence was established alongside the trading post. After issuing orders to Farquhar and the remaining Europeans, Raffles left the next day, February 7, 1819. Raffles also planned to start a British presence in Achin, at the northern tip of Sumatra. As soon as he left, the Raja of Rhio sent letters to the Dutch, claiming innocence and a British encroachment. The Dutch in Malacca acted at once, and ordered that no Malays could go to Singapore. 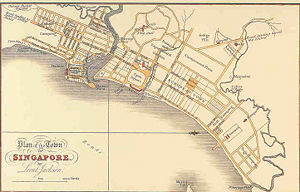 Raffles' bold claim of Singapore created a curious geographic situation where although Penang was clearly closer distance-wise to Singapore, Raffles, in his capacity as the Governor-General of Bencoolen, was in control. This undoubtedly irked the authorities in Penang to the point where they refused to send any sepoys to Singapore to complete the garrison. Official Dutch complaints came before the end of the month, and Raffles attempted to appease the situation by instructing Farquhar to not interfere with the politics of surrounding islands. Despite numerous threats and serious considerations by the Dutch Governor-General in Java, the Dutch did not take any military action. The muddled political situation in Johore and Rhio also created a certain uneasiness and instability for the two nations. Turku Long was claimed to be a pretender to the throne, and since the succession laws in the Malay sultanates were not as clear cut as, for example, the Salic laws of Europe, the treaties signed between native rulers and the European powers always seemed to be on the verge of being invalidated, especially if a sultan is deposed by one of his siblings or other pretenders. Nevertheless, amidst the uncertainty and intrigue, Raffles landed in Achin on March 14, 1819, with the begrudging help of Penang. Once again, it seems that multiple people were in power, but none wanted to formally deal with the British. The hostile atmosphere created allowed for Raffles to cancel the only meeting he was able to arrange, with Panglima Polim, a powerful divisional chief, fearing treachery. As the influential merchant John Palmer, Raffles, and fellow commissioner John Monckton Coombs of Penang sat offshore, waiting for a response, Calcutta debated whether to reinforce Singapore or not. Evacuation plans were made, but the Dutch never acted and finally Lord Hastings prompted Colonel Bannerman, the Governor of Penang, to send funds to reinforce Singapore. Raffles finally was able to convince his fellow commissioners to sign a treaty with Jauhar al-Alam Shah, the ruler of Achin, which placed a British resident as well as the exclusivity of trade. By the time Raffles returned to Singapore, on May 31, much of the immediate crisis that the establishment of the colony have caused in both Penang and Calcutta have passed. By then, the initial 500 villagers have grown to become 5,000 merchants, soldiers, and administrators on the island. Raffles was determined to both destroy the Dutch monopoly in the area and create a gateway to the trade with China and Japan, the latter nation he attempted and failed to reach while governing Java. While in Singapore, Raffles readily established schools and churches in the native languages. Rather, he allowed for missionaries and local businesses to flourish. Certain colonial aspects remained: a European town was quickly built to segregate the population, separated by a river; carriage roads were built and cantonments constructed for the soldiers. Otherwise, however, no duties were imposed and confident that Farquhar have followed his instructions well, he sailed for Bencoolen once again on June 28. Raffles was still the Governor-General of Bencoolen and having returned to it after the settling of Singapore, Raffles started more reforms that were, by now, almost trademarks of his reign upon colonies. Forced labor was abolished when he first arrived, and he declared Bencoolen a free port as well. Currency was regulated and as he had an excess of out-of-work civil servants, formed committees to advise him in the running of the colony. However, Bencoolen was not as self-sufficient as Singapore. The area was poor and disease-ridden, and the first reports from the committees reflected very poorly upon the condition of the colony. Unlike the salutary neglect Raffles granted upon Singapore, he slowed the European-inspired reforms and emphasized on the cultivation of whatever land that was available. Native authorities were given power in their respective districts and were answerable only to the Governor-General. The slave-debtor system was brought in in exchange instead of the old slavery system that Raffles abolished in Java, Borneo, and initially in Bencoolen. Slave-debtors were registered, and educational reforms started to focus on the children instead of the entire population. Raffles was looking into a long-term plan for a slow reform of Bencoolen. Unlike many other European colonizers, Raffles did not impose upon the colonized the language, culture, or other aspects of the colonizer. In addition to preserving the artifacts, fauna, and flora of his colonies, he also allowed religious freedom in his colonies, especially important as the Malay states were largely Muslim. However, Christian schools, especially schools for the very young and impressionable, were started by missionaries in all of his colonies. The death of Colonel Bannerman of Penang in October 1819 brought upon a new opportunity for Raffles to expand his power to also include the other minor British factories and outposts from Sumatra to Cochin China. He sailed to Calcutta and as Lord Hastings sought to consolidate all of the small British possessions in the East Indies. During his sojourn, he had the opportunity to argue for free trade and the protection of the private enterprise. Education and the retention of small British outposts were also discussed. The Dutch claim on the Sultanate of Johore and hence, Rhio, and the diplomatic exchanges between Baron Godert van der Capellen and Calcutta continued throughout this time. The legitimacy of the British treaties were also questioned once again, but finally, as Singapore grew at an exponential rate, the Dutch gave up their claim on the island, allowing the colony to continue as a British possession. However, the pressures put upon Calcutta ensured that no single governor of all British possessions in the Strait or on Sumatra was appointed, and Raffles, whose health was slowly ailing, returned to Bencoolen. Raffles returned to Bencoolen in ill-health, but as his health improved, he continued on his quest to learn about the island which he now called home. He studied the Batta cannibals of Tappanooly and their rituals and laws regarding the consumption of human flesh, writing in detail about the transgressions that warranted such an act as well as their methods. He also noted the rise of the Sikh religion in certain parts of Sumatra. By early 1820, Tunku Long had firmly established himself as the Sultan of Johore to the British, but the political situation in the area remains a befuddled mess, with the old sultan dying and many new ones attempting to gain either the crown or regency. As Farquhar was involving himself poorly in local politics, Raffles appointed Travers as the Resident of Singapore, replacing Farquhar. Upon his arrival, Travers found the colony a delightful smörgåsbord of different races and cultures, numbering over 6,000, and the Singapore trade was slowly overtaking the Java trade. As in Java, Raffles collected samples of local species of plants and animals, as well as described them in his journals. He also described other local tribes and their customs, especially their religions and laws. He brought the island of Nias under British rule as well, noting its more civilized state and production of rice. Yet, the production of food remained somewhat of a problem in Bencoolen. Raffles paid special attention to the agricultural methods of the Chinese, and wrote an introduction to the only issue of Proceedings of the Agricultural Society, in order to remedy this. His employer, the East India Company, however, had no other concerns outside of profit, and even as Raffles lived like a country gentleman and ran his colony as an estate, his expenditures in natural preservation was frowned upon. The removal of him was discussed in both Calcutta and London, while Castlereagh continued negotiations with the Dutch regarding the ongoing diplomatic conflicts. Luckily, the Singapore issue had its supporters in the House, so as negotiations went on in Europe, Raffles remained largely idle in Bencoolen. The only major issue, outside of the politics of local sultans, involved the replacement of Farquhar, who decided that he had no intention of leaving his post voluntarily, causing a moment of tension between him and Travers. Raffles' request for Travers to deliver dispatches to India nullified the issue late in the year, and Farquhar remained in charge in Singapore, with its survival still in doubt for many in both India and London, who believed that it would either be handed over to the Dutch or taken violently by the Dutch at the end of Castlereagh's negotiations. Farquhar, however, stirred up more trouble, conflicting especially with local English merchants over trivial matters of self-importance and overreaction over small infractions of white traders, for some of which he was reprimanded by Calcutta officially. Public works, commissioned by Raffles but undertaken by Farquhar, was becoming overwhelmingly expensive. Personal tragedies also started for Raffles. His eldest son, Leopold, died during an epidemic on 4 July 1821. The oldest daughter, Charlotte, was also sick with dysentery by the end of the year, but it would be his youngest son, Stamford Marsden, who would perish first with the disease, January 3, 1822, with Charlotte to follow ten days later. For the good part of four month the couple remained devastated. The year would be eventful with the suicide of Castlereagh and the appointment of Lord Amherst as the Governor-General of India, replacing Hastings. As Raffles grew restless and depressed, he decided to visit Singapore, before heading home to England. Accompanying him would be his wife Sophia and only surviving child, Ella. The Plan of the Town of Singapore, or more commonly known as the Jackson Plan. Raffles was pleased at the fact that Singapore had grown in such a short time into a commercially successful enterprise. The colony was a bustling hub of trade and activity. However, Farquhar's development work was deemed unsatisfactory and Raffles drew up what is now known as the Jackson Plan, and replanned the city according to recommendations of a committee headed by the colony's engineer, Phillip Jackson. It was still a segregated plan, giving the best land to the Europeans, yet it was considered remarkably scientific for the time. It was also during the replanning and reconstruction of the town that allowed Farquhar to clash dramatically with Raffles, who had considered Farquhar unfit for the position of Resident, so Raffles took direct control with a heavy hand. In 1823, Raffles instituted a code of settlement for the populace, and soon followed with laws regarding the freedom of trade. He also quickly instituted a registration system for all land, regardless of ownership, and the repossession of the land by the government if land remained unregistered. This act greatly asserted the power of the British government as it covered land previously owned by the Sultan as well. A police force and magistrate was then set up, under British principles. In a very short period of time, Raffles had turned a semi-anarchic trading post into a proper city with at least a semblance of order. Repeated efforts by Raffles for Calcutta to send a replacement for Farquhar remained unanswered. As Raffles started to hint at his impending retirement, he made Johore a British protectorate, causing a protest from van der Capellen. Finally, Calcutta appointed John Crawfurd, who had followed Raffles for over twenty years, as the Resident of Singapore. Captain William Gordon MacKenzie took over Bencoolen from Raffles. It's March 1823, and coincidentally, on the same day he was replaced, he received an official reprimand from London for the takeover of Nias. With politics against him, Raffles finally turned back to the natural sciences. He gave a speech regarding the opening of a Malay college in Singapore that heavily involved his observations of his years in Southeast Asia and the importance of both the local and the European languages. Raffles personally gave $2,000 towards the effort, as the East India Company gave $4,000. In 1823, Raffles drafted the first constitution for Singapore, which followed a fairly moralistic stance, outlawing gaming and slavery. A specific regulation in the constitution called for the multiethnic population of Singapore to remain as is, and there shall be no crimes based on being a race. He then went to work drafting laws, defining on exactly "what" constituted a crime. Finally, on July 9, 1823, feeling that his work on establishing Singapore was finished, he boarded a ship for home, but not before a stop in Batavia to visit his old home and adversary, van der Capellen. A final stop in Bencoolen ensued, and finally, a voyage home, interrupted by a harrowing experience when one of the ships caught fire off Rat Island, which claimed many of his drawings and papers. The Anglo-Dutch Treaty of 1824 finally settled the score in the East Indies. The British gained dominance in the north, while the entirety of Sumatra became Dutch. The Malay Peninsula and the Indian subcontinent were both free of Dutch interference. Raffles finally returned to England 22 August, 1824, over a year after he left Singapore. His longest tenure in Singapore was only eight months, but he was considered the father of Singapore nevertheless. Upon arrival in England in poor health, both Sir and Lady Raffles convalesced in Cheltenham until September, after which he entertained distinguished guests in both London and his home. He also made considerations to run for parliament during this time, but this ambition was never realized. He moved to London at the end of November, just in time to have a war of words in front of the Court of Directors of the EIC regarding Singapore with Farquhar, who had also arrived in London. Despite several severe charges put upon Raffles, Farquhar was ultimately unable to discredit him and was denied a chance to be restored to Singapore, but he was given a military promotion instead. With the Singapore matter settled, Raffles turned to his other great hobby-botany. Raffles was a founder (in 1825) and first president (elected April 1826) of the Zoological Society of London and the London Zoo. Meanwhile, he was not only not granted a pension, but was called to pay over 22,000 pounds sterling for the losses incurred during his administrations. Raffles replied and clarified his actions, and moved to his country estate, Highwood, but before the issue was resolved, he was already much too ill. He died in London, England, a day before his forty-fifth birthday, on July 5, 1826, of apoplexy. His estate amounted around ten thousand pounds sterling, which was paid to the Company to cover his outstanding debt. Because of his anti-slavery stance, he was refused burial inside his local parish church (St. Mary's, Hendon) by the vicar, whose family had made its money in the slave trade. A brass tablet was finally placed in 1887 and the actual whereabouts of his body was not found until 1914 when it was found in a vault. When the church was extended in the 1920s his tomb was incorporated into the body of the building. "Or a double headed Eagle displayed Gules charged on the breast with an Eastern Crown on the first, on a Chief Vert pendent from a chain two oval Medallions in Pale the one bearing Arabic characters and the other a dagger in fess the blade wavy the point towards the dexter in relief Or, the said medallions and chain being a representation of a personal decoration called the Order of the Golden Sword conferred upon by him by the Chief or King of Atcheen in Sumatra as a mark of the high regard of the said King and in testimony of the good understanding which had been happily established between that Prince and the British Government; and for a crest out of an Eastern Crown Or a Gryphon's Head Purpure gorged with a collar gemel Gold." The Coat of Arms has been adapted into the school arms of Raffles Institution and Raffles Junior College. It can also be found as part of a stained-glass window in St. Andrew's Cathedral, Singapore. The motto of the Raffles family is in cruce triumphans, meaning triumphing in the cross. In Singapore and in other parts of the world, his name lives on in numerous entities, including Museums, fauna, Hotels, streets, monuments, schools, Colleges, and commercial enterprises, all of which bear his name. The London Zoological Society is one of the largest, and most prestigious, in the world. Raffles' legacy lives on in the city he founded, which became an independent republic in 1965. Raffles declared that Singapore was to be a free port open to ships from, and trade with, all nations. It has since developed as a multi-cultural and multi-religious society, with English, Mandarin, Malay and Tamil as official languages. Something of the spirit of Raffles can be discerned in this legacy, which values industry and commerce and openness towards the Cultural Other. Different cultures in modern Singapore have tended to fuse, representing what has been called 'cultural diffusion'. All links retrieved October 20, 2015. This page was last modified on 20 October 2015, at 14:20.